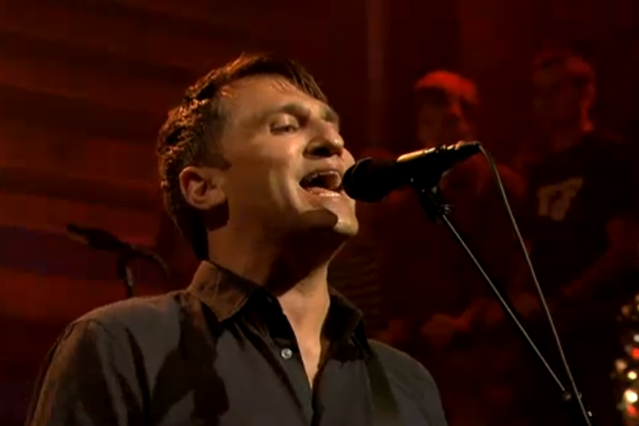 Afghan Whigs will play their first show in 13 years tonight at New York City’s Bowery Ballroom, but first the recently reunited rockers stopped by Late Night With Jimmy Fallon. During the broadcast, they gave a full-throated performance of their first new recording in five years, a strummy cover of Mary “Queenie” Lyons’ “See and Don’t See,” from her 1970 Soul Fever. As a web exclusive, Greg Dulli and his men also charged through a pummeling rendition of their 1992 song “I’m Her Slave.” Watch both below, and download the Whigs’ version of “See and Don’t See” from the widget at the bottom of the page. If only all Fallon musical performances could be this intense.